Many women who go through menopause notice their memories just aren’t what they used to be. While some of these changes may be physical, our lifestyles have major impacts on how well we remember. If we aren’t getting enough sleep, are stressed, or don’t have a healthy diet, our brains are not going to work as efficiently as they do when we are properly nourished and rested. Let’s take a look at some actions you can take today that will help improve your memory. You have more power over your mind and memory than you may realize. Everyone knows consuming a diet fueled by excessive amounts of artificial flavorings, unhealthy fats, and foods stripped of their natural goodness is not healthy. Yet we still do it. Soft drinks, sugary snacks, fast food — most of us indulge in these foods and drinks more often than we realize or like to own up to. Be honest with yourself. Keep a journal to see what you are eating. Include organic foods in your diet; these reduce your exposure to countless chemicals that may worsen memory and uncomfortable symptoms many menopausal women live with. Simple, whole foods are best for your entire body — including your brain. Eat plenty of fresh fruits and vegetables, as they are packed with natural compounds your brain needs to function optimally. Eat lean forms of protein every day. If you eat animal products, consume organic, free-range or grass-fed meat and/or dairy products. Try to get most of your protein from plants, such as legumes and dark green vegetables. Plant-based protein is inexpensive and results in less inflammation. In addition to improving your memory, you will lower your risk of developing cardiovascular illnesses, such as heart attack and stroke. If you suffer from bodily aches, you may find they diminish as well. Some foods are particularly helpful for enhancing memory and supporting the health of your entire nervous system. You may find you not only remember better when you consume these foods, you may feel better overall. Many foods have a calming effect on the nervous system and can help stabilize moods, as well. Foods that contain omega fatty acids enhance brain function and help you remember better by aiding the communication within your brain. Include cold water, wild-caught fish in your diet a few times each week. 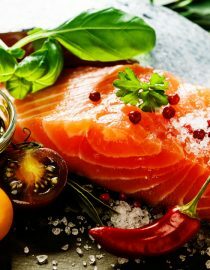 Salmon, mackerel, herring, sardines and halibut are packed with healthy fatty acids and protein. Include seeds in your diet, too. Hemp, sesame and flax contain similar brain-boosting fatty acids and a wide array of other nutrients that benefit your entire body. Seeds are best consumed raw, such as in yogurt or in salads, as they lose some of their healing benefits when baked or cooked. You may choose to consume supplements, but keep in mind they are exactly what the name implies: supplements. Use them to enhance your healthy diet, not as a substitute for one. I suggest flax, evening primrose or krill oil. If you can’t sleep, your ability to remember will likely be impaired. Foods containing tryptophan can help you sleep better at night, even if you suffer from night sweats or hot flashes. Turkey, tree nuts, peanuts, whole grain and organic dairy products are all rich sources of tryptophan or compounds that convert to this soothing compound. Have a small snack of a tryptophan rich-food an hour or two before bedtime and see if you sleep better. Research indicates drinking coffee may actually help memory. While it doesn’t indicate whether the benefits are due to caffeine or other compounds in coffee, countless people attest to the beverage’s ability to help them wake up. Other beverages, such as cocoa, green, white and black teas and yerba mate also contain caffeine. All of these beverages are rich sources of brain-protective antioxidants. Drinking your favorite beverage in moderation, early in the day, may help you focus and concentrate better. Studies indicate these drinks can help prevent age-related changes within the brain, increase alertness, and enhance the ability to pay attention. Some experts believe that coffee and other antioxidant-rich drinks may help ward off dementia and Alzheimer’s disease. You might also like...Why Am I Experiencing Cervical Discharge? Herbal teas and other herbs for menopause can offer many benefits: if you suffer from fatigue, they may enhance energy; they relieve stress, which is often a factor in memory problems; if you can’t sleep, whether due to anxiety or hot flashes, herbal medicine can help. Ginkgo, ginseng, eleuthero, ashwagandha, gotu kola, bacopa and rosemary are some of the many herbal remedies to choose from. If stress is interfering with your ability to remember, try linden, chamomile, lemon balm, passionflower or skullcap. These herbs are excellent sources of the micronutrients your brain needs to functions well. If sleep disturbances are interfering with your memory, try some sage or black cohosh, particularly if you suffer form night sweats or hot flashes. Valerian and hops may ease you to sleep. Get up and move around, particularly if you are completing tasks that require long periods of sitting. Go outside — your senses will be sharpened and you will feel refreshed and better able to concentrate. Even a two-minute break from a task to look out of a window may help. Pace yourself when you have long, intense or boring projects to complete. Physical activity provides immediate energy and enhances the circulation of your brain. Physical exercise doesn’t only aid the circulation of your blood, it enhances the flow of all fluid with the tissues of your body. Make sure you drink plenty of fluids, particularly while exercising, so you don’t become dehydrated. Dehydration can lead to headaches and fatigue, which may impair your ability to think and remember. While caffeinated beverages may increase your level of alertness, don’t overindulge in them as they can be dehydrating. All alcoholic beverages dehydrate and interfere with your ability to remember. Take the above steps today and you will rapidly begin to see improvement in your ability to remember and will feel an increased level of overall wellness. Menopause and high blood pressure often surface around the same time in a woman's life. Consider these tips for keeping blood pressure under control.